I have memories of Sundays growing up in Wolverton in the 1940s and 1950s but none that I can recall with any enthusiasm. Sunday was the most boring day of the week. It was unlike any other day. Adults probably found the whole experience a welcome relief from the pressures of the working week. For children it was another matter. To start with we were not allowed to go out and play in the street. It was the general feeling that adults, after a hard week, had earned some peace and quiet and were entitled to lay in on Sundays and the last thing they wanted was the raucous chatter of children arising from the street. This rule was universally applied. No parents allowed their children out on Sunday mornings. So every Sunday morning we were confined to the house. Unless we were sent to Sunday School. I for one was, and I have recounted some of these memories here. As I got older I was recruited into the church choir, which meant going from the Church Institute to don my musty smelling cassock and surplice for the Sunday morning eucharist. Those activities consumed my morning until midday. The institution of Sunday lunch was the keynote of the day. My mother, like every other housewife was busy with the preparation of what was probably the most sumptuous meal of the week and my father left the house at five to twelve for a few pints with his friends at the Top Club. He was under strict instructions to be home by 1:30. Usually he made it on time. Entertainment meanwhile was limited to the radio – at that time The Billy Cotton Band Show and then a record request program called Forces Favourites where soldiers stationed abroad, mostly in Germany, could ask for records to be played with a message to their families at home, or vice versa. This hour long program was hosted by Jean Metcalfe, wife of Cliff Michelmore who later became better known as a TV presenter. Even in those days the BBC was a family affair. The show was popular and after British forces overseas were reduced it changed its name to Family Favourites. At about 1:15 my brother and I were called upon to lay the table in expectation of our father’s arrival. By this time we were close to starving, not having eaten since breakfast. After lunch my father retired upstair to sleep off the food and ale. During this time we were not allowed to play the radio or make any undue noise. David Marks recollects that his family generally went for afternoon walks (which you cane read about here). I don’t remember my parents being much interested in this kind of thing. However we would often visit one or other sets of grandparents for Sunday tea, which made a sort of change. Tea was the next juncture of the day. There were variations in this routine. In the Summer months we might go down to Davies’s on the Square to buy a brick of Walls Ice Cream. In the depths of winter toasting muffins before the fire was popular. Later to bed. These kind of Sundays are now a distant relic. Shops were not allowed to open for trading except for the sale of sweets. Nothing else could be sold. So this limited trading to two shops in Wolverton, both sweet shops – Davies at No 5 The Square and Bews at 81 Stratford Road. I think Woodwards (latterly Terrys now a Polish Convenience Store) may have opened in the afternoon to sell ice cream and sweets. And here is a good example of how the Sunday Trading laws worked. Woodwards was also a general grocery, but you could not buy a tin of peaches from him on Sunday. No professional sport was allowed on Sunday, nor was there any amateur football, which was purely a Saturday afternoon activity. There were amateur cricket matches on Sunday afternoon and that was that. Nothing really opened up in that direction until the John Player Cricket League began in 1969. No stage performances were allowed on Sunday. The only concession to entertainment allowed pubs to open from 12 to 2 pm and 7 to 10pm. I am trying to remember if piano playing was allowed in pubs on Sunday but I can’t be clear on this. For some reason Cinemas were exempt from this ban and continued to show films on Sunday afternoon and evening. I suppose that the authorities though it was OK because the entertainment was not “live”. One institution that did do well on Sunday was the church. 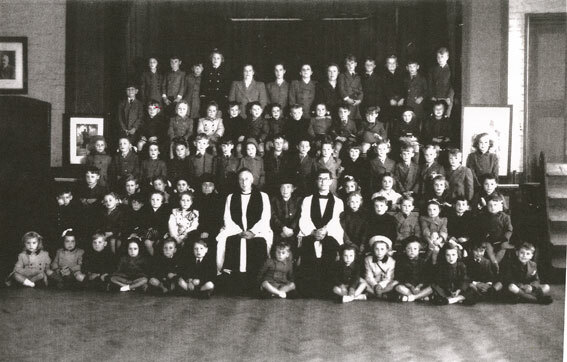 From my own time as a choir boy I can recall the church being full at Holy Communion and well-attended at Evensong. Nevertheless it all amounts to a pretty dreary day. These are not days I would readily return to.